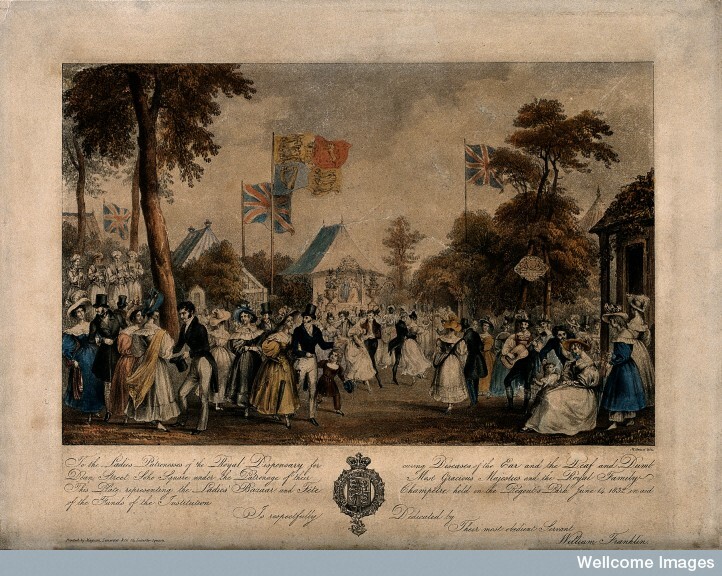 I briefly wrote about the Royal Dispensary for Diseases of the Ear, remarking how Curtis’ efforts to increase the prestige of the RDDE relied on patronage and support from respectable physicians and surgeons. London society had praised the RDDE and applauded Curtis for drawing attention the plight of the deaf and providing the poor and destitute public a much-needed services. To me indeed, it seems difficult to imagine any institution more entirely deserving of your support than which now implores it, whether you consider the wide extent of its influence, or the deplorable state of those whom it purposes to relieve. This humane establishment has been in existence for more than seventeen years, during which time it has been found of unquestionable utility; not confining its benevolent views to the inhabitants of the metropolis, but extending them generally throughout the country (original emphasis). It seems to me that London society clearly recognized the value of the RDDE and strove to ensure its success and continuance in providing care and treatment for ear diseases. *Richard Posonby’s pamphlet, A Sermon Preached…in aid of the Royal Dispensary for the Disease of the Ear (London: Published by J.G. and F. Fivington, 1834), is available at the British Library.